Bgo is a spectacular, vibrant and extremely entertaining online casino with a huge selection of online games and a mind-blowing bonus program. Australian players will find payment options very comfortable and the same refers to customer support that operates 24/7. The casino website is accessible equally well via desktops, tablets and mobiles, without having to install some apps on your device. You are strongly encouraged to browse across different main sections of the bgo website such as Casino, Vegas, Games and Live, as each contains numerous pokies, table games, live dealer games and other amazing gambling solutions. Players of Australia are offered a long list of trusted payment options, including e-wallets, bank cards, prepaid cards, and other. The minimum amount of deposit from any payment method is £10, while the max one-time deposit is almost £100k. The min withdrawal limit is £20, while the max amount is capped at £5k a day, £25k a week and £100k a month. The casino currency is GBP, and your personal money balance, bonus funds and other transactions are all displayed in Pound Sterling; however, payments can be done in various currencies, including Australian Dollars. For all amounts at the casino, the currency conversion rate is £1 to AU$1.5. The casino features an extensive and regularly updated bonus package with big prizes and user-friendly wagering conditions. They have two welcome sets, one for live casino players and the other for ‘regular’ players who intend to play pokies and other RNG games. A regular welcome package is comprised of bonuses on the first four deposits, totaling £1500. In addition, new qualifying players receive 180 free spins on Starburst. All the four bonuses in the package have to be wagered x35 times each (bonus amount only), which is a very low WR as compared with equivalent offers at other casinos. They regularly run fantastic tournaments, raffles and other bonus events with huge prize pools. In March 2017, for example, they had a £500,000 giveaway for playing some video slots. At about the same time, they celebrated the ‘birthday’ of two NetEnt’s video slots with the £50,000 Birthday Bash promotion. The creative developers at the casino constantly devise new promos, cash back bonuses, and more, so whenever you visit their website you are sure to find something to your taste. The casino has the enormous selection of three-reel pokies, five-reel pokies, progressive pokies, roulette variants, blackjack tables, poker games, keno, scratch cards, live games and other classic and modern titles released by Microgaming, NetEnt, NextGen, IGT, iSoftBet and other famous developers. 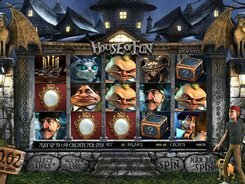 Some pokies are grouped by theme such as Movies & TV, Classic Favorites, and etc. Most games are available in practice mode, though you need to register first in order to be able to start playing. Each game is accompanied with a short description. 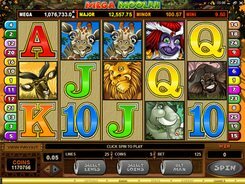 There are many progressive pokies in the Vegas section of the casino, including some rare titles from Virtue Fusion (The X-Factor Judges’ Jackpot) or the IGT’s Mega Jackpots series of progressive pokies.